There is always lots of food about for nibbling on and for turning into great dinners when we spend a family weekend together. I bring tomatoes and other fresh vegetables from the garden for salads, sandwiches and anything else we can pull together. My mom goes to the local bakery to make sure we are well-stocked with fresh croissants and other pastries. And being near the water, there is at least one trip out to track down fresh fish and other seafood. 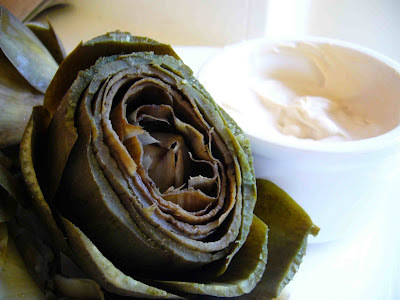 The local cheese shop provides many a pre-dinner nibble and we usually end up having at least one of our family staples like these artichokes with a mayonnaise dipping sauce. My mom has been preparing artichokes with this sauce my whole life. It may seem like an odd combination to some so I never tell people what it is when I serve it. I simply place it by the artichokes, let everyone dive in and fall in love with the taste and then giggle at their disbelief when they beg to know what went into the sauce. I usually have to make a second round to ensure there is enough left to finish off those last leaves. You can count on one artichoke per two people so with six of us in town, we prepared three. Fill a medium pot 2/3 full with water. Cover and bring to a boil. While the water is heating up, slice the top 1/3 off each artichoke and use kitchen shears to trim all the remaining spiky tips off the leaves. Once the water is boiling, place the artichokes in the pot. Cut a lemon in half and squeeze the juice directly into the water. If desired, throw the used lemon halves in the pot with the artichokes. Cover and boil for 40 - 50 minutes until tender. Prepare the dipping sauce by stirring 1 T soy into the mayonnaise, only adding the additional T of soy if you think it needs more bite. When you think the artichokes are finished, pull off a few leaves from the middle of one and test. If finished, remove the artichokes to drain on paper towels for a minute or two and serve on a platter next to the dipping sauce. Put a bowl out for everyone to throw their spent leaves in and enjoy! I just discovered your blog through the foodie blogroll and I'm enjoying reading your latest posts. I can't believe you have a recipe for pickle! I pick up that stuff whenever I'm in England, so good! Artichokes are a favorite of mine... I love it with or without sauce but when I was a kid my mom made a sauce with mayo and garlic-- that was my favorite part. Hopie - even though I've been eating sandwiches with pickle for years, I never realized what it was until this last trip. Glad I finally have a recipe for it! Alexa - love the garlic idea, may have to sub out the soy sauce on the next round. Michele - or lemon. As a general rule I love mayonnaise so anything and mayonnaise is a good idea to me!